Berlin is the perfect city for everybody who is crazy about culture and art! Countless museums, galleries and daily new exhibitions leave nothing to be desired. But even Berlin’s streets themselves are art: street art artists from all over the world, as well as local stars of the scene, have turned Berlin’s house walls into canvases and decorated the city with larger-than-life works of art. There are so many things to discover all over the city! But what is the best way to go, to see all of Berlin’s street art? How about an interactive street art map? The guys from DEFSHOP have put together on a map the 46 best murals of Berlin so you can see at a glance where they are and how to get there. The only two things you have to do is first, to choose one of the 4 routes in the menu of the street art map and second, buy a metro ticket. The selected murals can all be reached using a single underground or suburban railway line. By clicking on the icon, you will not only find the exact address and the nearest S- or U-Bahn station, but also more detailed information about the artist and exciting backgrounds to the artworks. The perfect way to do a street art tour on your own and get to know Berlin’s most beautiful murals! As already mentioned there are 4 different routes to choose from. The first one is the U1 route which goes through the heart of the city and contains 14 murals. The secound one is the U8 route that leads from the North to the South of Berlin and hides 11 murals. Number three is the city railway route that runs right through Berlin along the Spree river. Last but not least you can take the Tegel route, situated a little off the beaten track, in the very north of Berlin. The underground line U6 starts right where the street art objects are located and the 6 impressive murals lie close together in a residential area. All in all the interactive street art map is a great tool to discover the abundance of street art in Berlin for free and with no long journeys. It should be added, however, that you cannot download the map. So you better have a look on the map before you start and plan your route as it might not work on your way. You also should keep in mind, that the murals are not exactly located at the S- or U-Bahn station and you have to walk a bit to reach it. Some of them are also very hidden so keep your eyes open and don’t miss it! One of Europe’s largest open air parties is celebrated on New Year’s Eve in Berlin, between Brandenburg Gate and the Victory Column. Together, about one million people await the beginning of a new year. On New Year’s Eve Berlin invites its guests and residents to celebrate the beginning of a new year with a great open air party. Each year bands and DJs attract about one million people to party along the “Straße des 17. Juni”, between Brandenburg Gate and Victory Column until the early morning hours of the 1st of January. At midnight a massive firework marks the start of the new year. The party area comprises two kilometres from Brandenburg Gate along the “Straße des 17. Juni” until the Victory Column. The festival programme includes music acts, international stars and performances, light shows, food from all over the world as well as the famous firework. The party kicks off at 00:30 and has no definite ending. At the entrances of the festival mile security checks take place. Any kind of firework is strictly prohibited. Pointed and sharp items as well as items which can be used as weapons, are not allowed to be carried inside the party area. The same counts for glass bottles and big bags. If you don’t want to celebrate New Year’s Eve among millions of people and you are one of the lucky persons staying at wombat’s CITY Hostel Berlin, the roof terrace and bar might be the place to be. You’ll have an amazing view over Berlin’s city center and our wombar offers drinks at reasonable prices, specials and Happy Hours. As for us, we think that too much buzz is made about the famous clubs which are mentioned in all the travel guides and magazines. In fact, there are so much great places to go out that you can have great fun everywhere in this town. 1. Where the nightlife happens: Mostly in the (former) districts „Mitte“ (middle), north of it in Prenzlauer Berg, Friedrichshain (east) and Kreuzberg (south). 2. District “Mitte” was really wild and cool in the 90ies… By now, it has become commercialized and not as hip as it was back then. However, if you are looking for a wide range of pubs and bars, the “Oranienburgerstraße” (Oranienburger street) might be a good starting point for a night out. 3. “Prenzlauer Berg” is the place where the scene moved on to when “Mitte” became too commercialised. Kollwitzplatz, Helmholdtplatz and Schönhauser Allee are now the best neighbourhoods to find loads of “drinking holes”. Beware of the “Kastanienallee” street: this place is overpopulated with “too-hip-crowds”. 4. “Friedrichshain” is still one of the least gentrified and most alternative districts of Berlin. Here you find industrial wastelands turned to huge clubs as well as cosy pubs offering great numbers on outdoor seats on the wide sidewalks. 5. “Kreuzberg” is… Well, it’s considered a city of it’s own rights in terms of going out and having fun. Our recommendation: just spend an entire day and night there to check it out. Enjoy! 6. Don’t make plans: Just let yourself go, ask Berliners where to find good parties tonight and enjoy whatever comes up. 7. “The later, the cooler 1”: Most pubs and bars don’t get very crowded ‘til 9 or 10 p.m. They usually stay opened ‘till 3 a.m.
8. “The later the cooler 2”: Don’t go to any clubs before midnight! On the other hand, sometimes you can take advantage of happy hours or reduced entrance fees when showing up early. 10. The good news for the day after: You can have breakfast anytime before sunset. So don’t mind getting up early. Three talented content creators are taking the #wombatsTraveller challenge and join experienced travel influencers from iAmbassador for a 4-day trip to two wombat’s destinations (Berlin, Vienna, Budapest, London and Munich) in June. Together, they will create content and share their travel experiences via their blogs and social media. The experienced bloggers will be there to mentor and provide tips on content creation, building an audience and social media marketing. Based on their performance, a jury will then decide who will be the #wombatstraveller in 2019. The main factors which the jury will focus on include the style/quality of the content, diversity of media used and level of engagement. By travellers for travellers is the credo of wombat’s hostels. Everyone at wombat’s shares the passion for travel. The same passion that is required to make traveling your profession and become an influencer. We’re celebrating our 20th birthday with the grand opening of wombat’s VENICE Mestre next year. Therefore we’ll have special events in Berlin, Budapest, London, Munich and Vienna throughout our anniversary. To honor this anniversary we decided to run a special challenge: the #wombatsTraveller 2019! We give one young travel blogger chance to take your blog and/or social media presence to the next level on the basis of a paid internship as a brand ambassador for wombat’s between April and September 2019. We love working with influencers and over the years we have learned a lot about the efforts and skills that stand behind a successful influencer. We are extremely happy to partner up with iAmbassador for this project. It’s great to have them on board and rely on the expertise of a huge travel blogger network and many years of experience in the field. Spring has almost sprung in Berlin and what better way to celebrate the sun than to spend a hungover Sunday afternoon roaming around buying second hand goodies. And let me tell you, there is no better way to cure a throbbing headache than walking back to the hostel with a freshly squeezed orange juice in one hand and a broken accordian in the other. Berlin has quite a few markets on offer depending on what you’re in to. This is a list of our favourites here at Wombat’s. 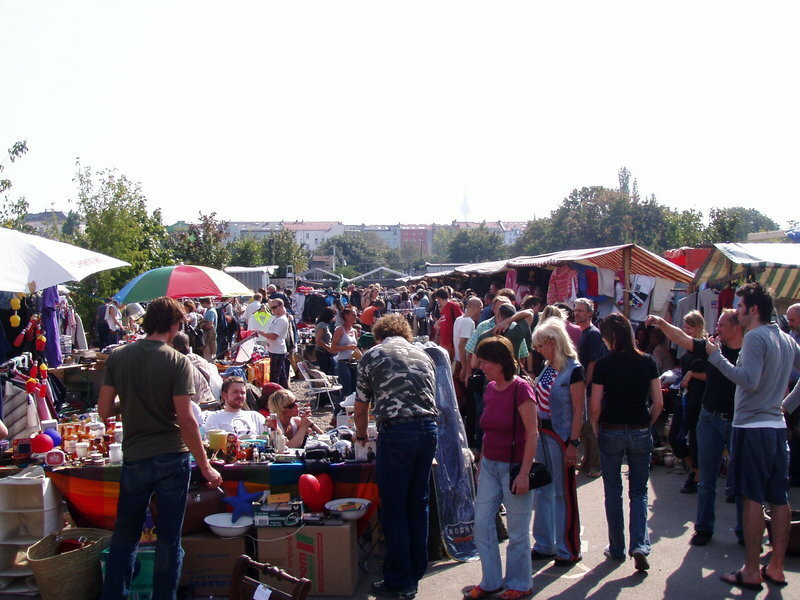 Located an easy 15-minute walk from wombat’s, “Mauerpark” (literally translating to “Wall Park” – it runs along one of the few remaining sections of the wall in the city) is easily one of the biggest and most famous flea markets in the city. You can spend hours wandering through endless stalls selling all kinds of things from locally manufactured clothing to second hand watches to organic produce. It can get pretty packed and busy though…so when the crowds are too much for you, grab a beer, have a lie down on the grass and listen to some of Berlin’s most eccentric street musicians doing their thing. If you’re lucky, you might even get the chance to see the “Bearpit Karaoke” in full swing. If you’ve ever wanted to butcher your favourite pop song outdoors in front of 400 people, Mauerpark is the place for you. Smack bang in the middle of hipster suburb “Friedrichshain” is the small but extremely popular flea market on Boxhagener Platz. Join the 20-somethings on their way back from the club, parents with their children and some of Berlin’s most stylish residents trawling through a huge amount of second hand books, records, furniture, clothing and other knick-knacks. “Angebot, angebot, angebooooot!” Every Tuesday and Friday, Kreuzberg’s Maybach Canal comes alive with the sights and sounds of Turkish produce sellers offering visitors to the market the best deals on kilos of oranges/tomatoes/apples, etc. etc. etc. It is not for the faint hearted; there’s usually a huge bustling swarm of tourists, locals and families bargaining with shop-owners. Towards the end of the market though, one can relax with a crowd of other exhausted market-goers. Sitting along the banks of the canal eating Turkish breads and dips and listening to street musicians. Held in front of the Town Hall in district “Schöneberg” (where John F Kennedy made his famous Ich bin ein Berliner speech) this flea market has more of a local character where Berliners come to buy and sell their bric-a-brac. Sellers sit under tarps and sell all kinds of random things out of cardboard boxes. If you have the time to trawl through all the rubbish, it can be totally worth it. But don’t forget…haggle!! Fernsehturm on Alexanderplatz during the Festival of Lights. Berlin glows! Famous landmarks, cultural monuments, historical buildings, streets and other locations including Brandenburg Gate, Berlin Cathedral and the radio tower are literally being highlighted during Berlin´s Festival of Lights. It takes place between the 5th and the 14th of October 2018. Summer is over and autumn threatens to turn the whole city into a grey mass. This festival fights darkness and makes an effort to boost the city´s colours. Taking place every october since 2005. The festival has turned into a magnet for visitors to Berlin. The Festival also includes various special events such as the arts and culture event “OpenCity“, the “LightRun”, “Jazz in the ministry gardens“ and Sunday sales in shopping centres. Besides, the Festival of Lights is also an active partner in charity events presented and organised by the “City Stiftung Berlin”. Only the involvement of many people and partners made it possible to transform the Capital into a shining stage. That is why many individuals, companies, institutions and artists engage in this festival. Social commitment and entrepreneurship have been essential for the Festival of Lights from it´s very beginning. The Festival of Lights supports the City Foundation Berlin since 2005 and thus, promotes charity projects. During the festival, the City Foundation Berlin presents an extensive charity program. All sights are in easy reach from wombat´s CITY Hostels´ Berlin branch. From our amazing rooftop terrace you can even see some highlighted sights, such as the Fernsehturm on Alexanderplatz. Berlin. So much history, so much to see and do. Berlin is my favorite city in Europe and every time I go back, I love it even more. Walking into the wombat’s there gave me a sense of familiarity, as it has the same look and friendly feel as the one I’ve been to in Munich. The location is also as equally convenient, right by a tram and train station, Rosa Luxemburg Platz. Helpful staff, clean rooms, and an awesome rooftop bar with great Happy Hour specials! My new wombat’s friends and I decided to go on the Alternative Art Walk the next day, which was one of the recommendations wombat’s gave us. We met in the Lustgarten at 11:30am (not too early after a night in Berlin!) and the guide started telling us about the street art culture in Berlin. We went all around the city and looked at sculptures, graffiti, countless murals, and ended at the East Side Gallery, the longest section of the Berlin Wall still remaining. We realized how often we walk around a city while touring and don’t actually SEE a lot of what is there, right in front of us. For the next few days, I started noticing all the art on buildings, street signs, shop windows, etc., that I wouldn’t have looked for before this tour. It was really informative and a cool way to learn about the artistic, edgy Berlin culture. A friend and I also decided to check out the tour of the Reichstag (German Parliament building) dome, which is also free. The only drawback is that you have to make a reservation in advance, which we stood in line to do for about 30 minutes. It was worth it, though, and taught us a ton about the history of German government. You can see all the important landmarks from the top of the dome, which the tour points out as well. Getting some really good use out of my boots, we walked all around to discover Berlin, visiting the Holocaust Memorial, the Berlin Cathedral, the Brandenburg Gate, and the Otto Weidt Museum (all free). Luckily there are street food stands with Glühwein (warm spiced wine) and Currywurst (a Berlin favorite) everywhere along the way! Lastly of my free excursions, I decided to go to the Topography of Terror, which is more of an exhibition than a museum. It’s intense, a lot of reading, and a lot of disturbing Holocaust imagery. It’s worth a visit if you are interested in learning more about the dark history of Germany during World War II. For those who are lucky enough to have a smartphone while traveling, the Berlin transit app, “BVG”, was incredibly valuable. You can simply put in your destination and it will give you a timetable and route using bus, tram, train, or a combination of the three. I bought a 7 day transit pass for 28 EUR, which was valid for any form of public transit. Berlin is big, so it was worth it since I was there for so long and covering a lot of ground. As for nightlife, there are a thousand options due to the diversity of people in Berlin. I would tell the wombat’s crew what kind of party/event you are looking for, and they can point you in the right direction. Just be prepared for a late night because I don’t think the bars ever close! If you are there during late November/December, be sure to stop by the Christmas markets for some food, warm drinks, and shopping, there are several scattered around the city. Overall, another great experience in a colorful, historic, and extremely diverse city. Yep, Berlin is still my favorite. You´re looking for a good Bar, nice Café or facilties like a cash machine near wombat´s CITY HOSTEL BERLIN. Just download this PDF to your device and you´re ready to explore our lovely neighborhood. Brace yourself for tabletops stretching all the way up one track through the Mauerpark, and back down the other. This is the king of flea markets in Berlin, where you’ll find anything from second-hand bicycles to cardboard boxes overflowing with crockery, household furniture and smart vintage shoe stalls. Follow the smell of steaming sauerkraut to the food court, where benches provide respite for weary (or hungry) hunters. Refuelled, stick around till the afternoon for the weekly public karaoke session, which booms out from the park’s amphitheatre. Bernauer Straße 63-64, 10435 Berlin (0176 2925 0021, Mauerpark Flohmarkt). U8 Bernauer Straße. Open 7am-5pm Sun.